Eddie Irvine's Race ExperienceExperience the thrill of Formula One head-to-head with Eddie Irvine's Race Experience. KartingExperience the Best Karting thrills of high speed racing. PaintballThe fastest growing extreme sport in the world, if you haven’t tried it yet, you are missing out. Football3rd Generation 6 Fieldturf Football Pitches all INDOOR! Laser CombatExciting game scenarios on a purpose-built 4000 square foot indoor arena. Room 2 RaceThe most realistic virtual Race Experience with 20 linked race simulators. Snooker, Pool and FootpoolSnooker and Pool cues are available for hire or purchase. Padel TennisTwo new padel tennis courts are now available to book at Eddie Irvine Sports. Thunder ParkThunder Park is a 14,000-square foot Action Sports facility. Owned by Formula One ace Eddie Irvine, and situated in Bangor, County Down, Eddie Irvine Sports is one of Northern Ireland’s premier indoor sporting facilities. 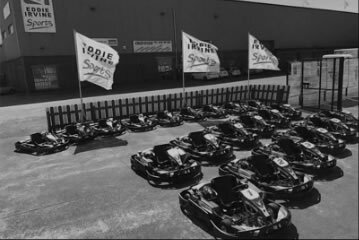 Open all year round, EIS has one of Northern Ireland’s largest indoor purpose built karting. Keep up to speed with our NewsletterStay connected, please enter your details for updates, offers, events and latest info.